accumulated many lessons learned along the way. Where the needs and opportunities of our clients have evolved, so has our practice, expanding our capabilities to provide design and designbuild solutions for a wide variety of industries that include oil, gas & chemical, food & beverage, federal government & defense, consumer-products, industrial manufacturing, civil infrastructure, transportation, workplace, healthcare and mission critical clients. Our website too will evolve over the coming months, and we encourage you to explore who we are and what we do. Fundamental to Benham’s culture is the belief that all accidents are preventable. Our corporate safety program is fully integrated into our design and construction planning process, resulting in improved project performance at all levels. Our corporate safety program complies with Title 29 CFR Part 1910 and Part 1926 Occupational Safety and Health Act (OSHA). 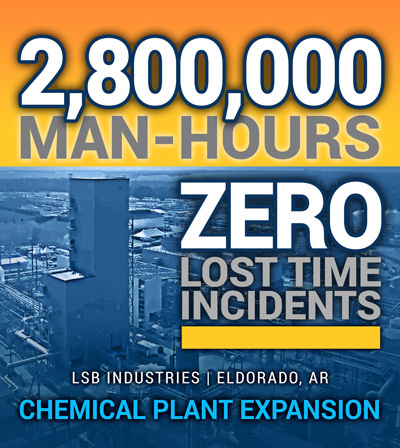 As needed, we supplement this program with client specific safety plans, manuals, or requirements. This provides a healthy and safe workplace for all of its employees, sub-contractors, vendors, visitors, and client representatives in addition to protecting the public from any and all health hazards which may result from our operations and defines our safety mission. To this end, all field personnel assigned to Benham projects must attend a site-specific safety orientation prior to beginning any task associated with the project. "Nothing is more important to our firm’s future than our past performance. The caliber of work we have done and are doing…the thoroughness with which we analyze a client’s need and the creative thought we put into meeting those needs…These are the things which lead to new clients and new business and assure the firm’s growth"
Haskell pioneered the design-build model more than 50 years ago and brought it to its rightful place within the AEC industry. We are a global network of experts providing integrated design, engineering, construction and professional services to clients and communities. Exclusive to healthcare with a mission to help organizations create patient centered, life-affirming environments that integrate a clear strategic purpose with operational effectiveness. Seiberling is an Engineering and Technical Consulting Company providing process, clean in place (CIP) and steam in place (SIP) design and automation services to the Food, Dairy, Pharmaceutical and Biotech industries. Consulting firm whose mission is to provide responsive, quality, cost-effective, program and construction management services for complex projects and construction dispute resolution.